Today is the animals' day, every creature's day with which we share our planet. Creatures, which should have the same rights as us, but thanks to us they have become nothing but the objects of our giving vent to our lower instincts. Millions of animals are being killed for food every year. Millions get hurt, chased, and killed in hunt. Millions are killed in many different experiments and researches. Millions of fish die in pain caught in fishing nets or on the decks of the ships, hooked or harpooned, like this is the case with many see mammals and sharks. Millions of animals get killed because of their fur. Millions suffer and die in cages, on chains, or abandoned in the streets. All of that is completely unnecessary and we can avoid it all. It is time that we stop with the torture. Animal Friends is organizing a fair where they will present the food prepared without hurting animals, cosmetics that wasn't tested on animals, and also distribute materials which promote protection and animal rights, like the sympathetic way of life. Our goal is to show the public that everything begins with them. The pain, which animals have to endure, is caused by the industry which exists because of them. This date we will dedicate to all the animals in pain we sympathize with and whose agonizing pain we cannot look at, especially to those sick and whining that are wandering in the streets. This date we dedicate to the animals who live in pain out of our sight, whose screams hear only those who want to hear them. This date is the date of all the animals. Every animal on any farm, in any laboratory, in any circus, in any cage in the world, every animal which will be slaughtered today has its day - World Animal Protection Day. One day the animals will be free. One day the worst suffers imaginable will finally disappear. The day will come when eating animal corps will be judged, watching the caged animals impossible and thing of the past, and their slaughtering psychopathic. Until that day of freedom for every creature comes, we have this single day which we dedicate to the animals. 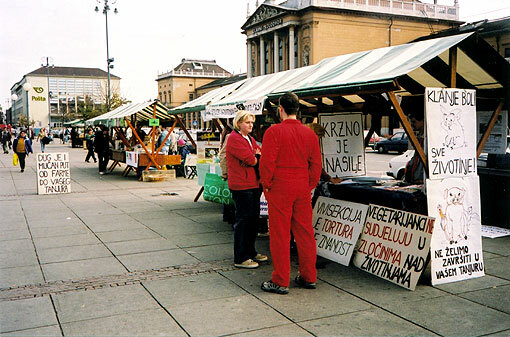 the health food fair, Starcevic Square, Importanne Center entrance, 11 A.M.
the program in the Zagreb Zoo starts at 2 P.M.